Moving to the Hip Hub City | McQuillen Creative Group, Inc.
Aberdeen, the Hub City of the Dakotas was the place to locate to when Easterners looked to pioneer the West. The railroads were racing one another to blanket uncharted territory with a web of tracks and communities. If you build railroads, people will settle land. If you establish towns for the trains to stop in, you have a market for passengers and freight. It was a great plan that essentially worked. 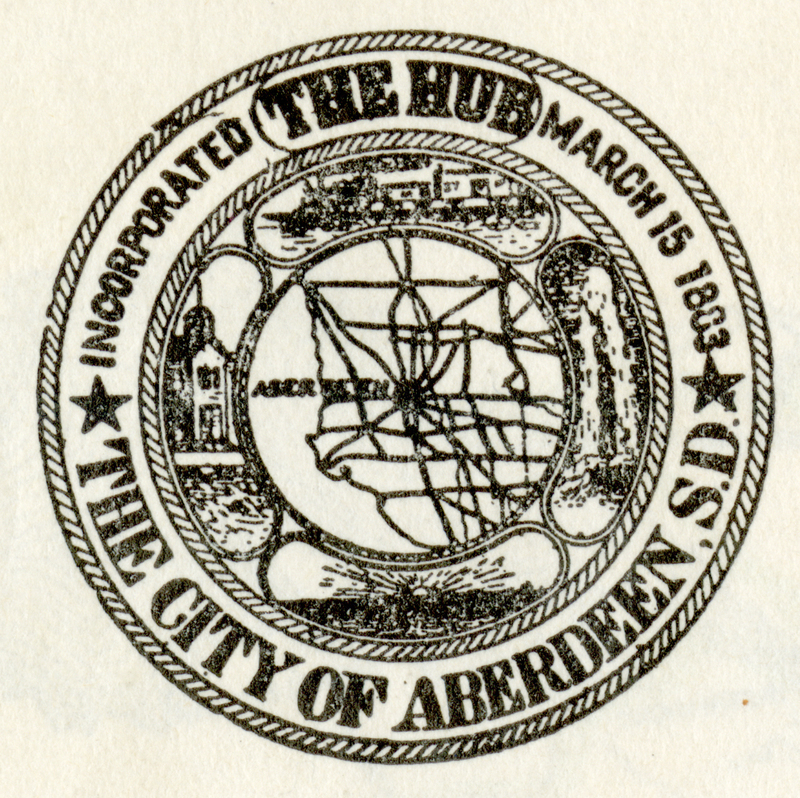 Many in our Aberdeen area believe the term Hub City was derived because four railroad lines converged in Aberdeen, making it the central hub for each railroad. Looking at Aberdeen on a map, you’ll see we look like the hub of wheel, with the spokes being the various rail lines. But look at Watertown at the same time. That community also had an equal amount of rail lines emanating from it. Why then, was Aberdeen dubbed the Hub City, while Watertown was not? The answer: Savvy businessmen who understood marketing. They carved out an enormous niche for our growing city, which was capitalized upon for decades. That is until community leaders gave up on the term, not fully understanding its importance as a core competency to make Aberdeen stand out as the place to be. Aberdeen the Hub City was not about railroads, it was about regional, national and global commerce. I contend, that is still the case. The back of the Mayorof Aberdeen’s 1924 stationery highlighted the main selling points of locating business in Aberdeen. Note the number of rail lines eminating from both Aberdeen and Watertown. They are the same, yet savvy business people in Aberdeen dubbed us the “Hub City of the Dakotas” claiming economic development rights over the entire region. The notion of the community of Aberdeen was conceived in Watertown, SD at the government land office. In early 1880, a group of men sat around a table and one pointed to a spot on a map in southern Brown County. The man pointing was Charles H. Prior, townsite agent for the Chicago, Milwaukee & St. Paul railroad. 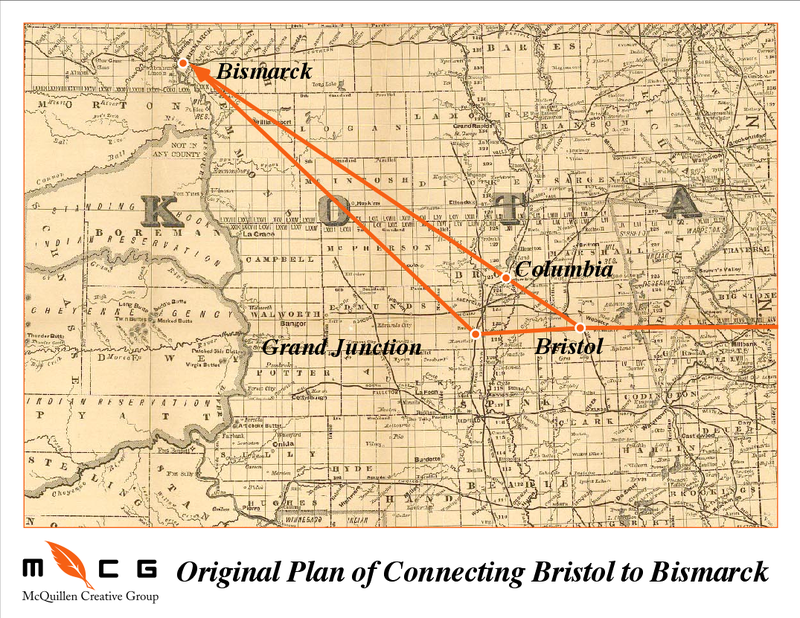 They were attempting to connect Bristol, SD to Bismarck, ND by way of Columbia, SD. Prior pointed to a spot on the map and proclaimed that is where they would intersect the competing North Western railroad and plat a new town. But Prior couldn’t get land rights through Columbia so an alternative course was needed. Columbia was the Brown County seat at the time, and subsequently played hardball demanding cash for the land rights for tracks and a depot plot. Other towns willingly gave this sort of thing away to attract the railroad and the economic advantages that came with them. Columbia also demanded a drawbridge over the Jim River, to accommodate steamboats. Mr. Prior did not approve. Needless to say, Columbia lost out. Mr. Prior would invent his own town and bypass Columbia. Soon after that meeting, in the summer of 1880, Rice Brothers and Boyden of Watertown set up a store where Prior had indicated the new town would be situated. They did so in anticipation of the intersecting of the new Chicago Milwaukee & St. Paul line with the North Western line. Intersections mean more people and more business opportunity. They set up a post office and registered it as Grand Crossing or Grand Junction. However, Prior didn’t like the idea of including the North Western Railway in his new town so he changed his mind and decided to move his new town, Aberdeen, two miles north of Grand Crossing, far enough away from the North Western, in the middle of nothing but a slew. When Prior made his announcement to move the new C.M.&St. Paul townsite, the Rices and Boyden moved their building to the new town location. They placed it in an area which eventually became the corner of Main and First avenue SE. The railroads liked the Aberdeen area because it was flat, allowing them to develop into (and through) the city quickly. 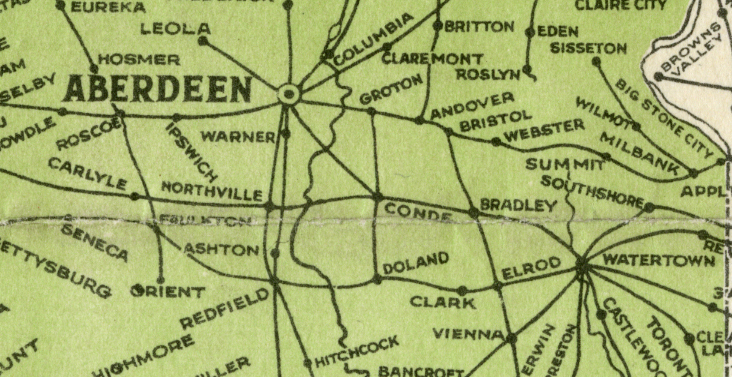 Because of the four railway companies, and their corresponding tracks (as many as 10 spoke-like rails) Aberdeen was established as a distribution point for area communities and other states. This caused all sorts of industry to set up here and move here. The big question is, how can a town that is randomly plotted have any sort of sustainable future? The railroads plotted towns about every 10 miles and the excitement of new towns were quickly realized by easterners coming to this area to take advantage of the surrounding farmland. Aberdeen’s self-proclaimed “Railroad Hub of Dakota” moniker made it recognized as the center of Dakota Territory and people wanted to be where things were happening. Other than fertile soil, Aberdeen has no natural resources, in fact, early artesian wells that supplied the city with water, a selling factor, soon became a major detractor for development because the water was too hard for food and machinery. Aberdeen was named after Aberdeen, Scotland, the home of C.M.& St. Paul railroad president, Alexander Mitchell. Many will recognize this name as the same name on the public library. The town was established in 1881 when land was officially made available for sale in the township area, but was not officially incorporated until March 15, 1883. Aberdeen’s biggest growth spurt came after 1910 when population rose over 160% and climbed to nearly 11,000 residents. 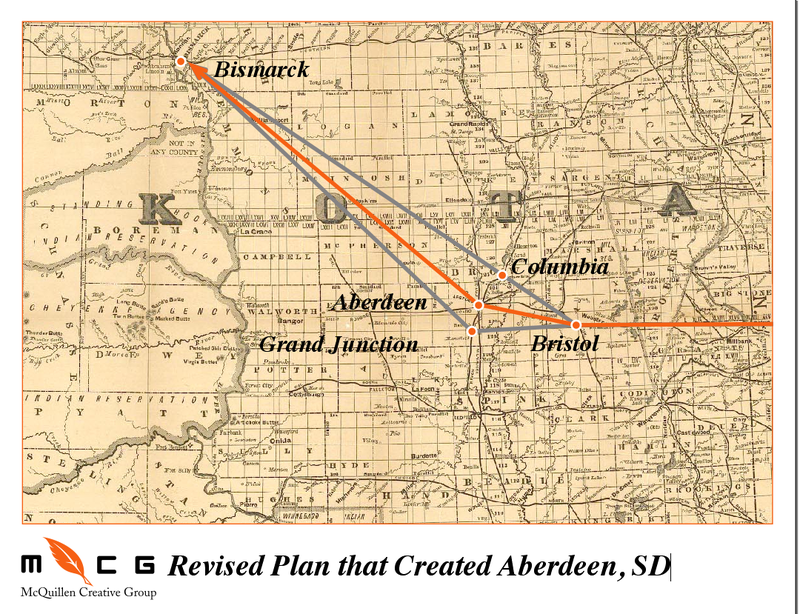 Some suggest this bump was due in part to the fact that the Chicago Milwaukee & St. Paul Railroad had reached the west coast, creating a transcontinental route through Aberdeen. The slow rise in population after this point is speculated to be a result of the fact that pioneering was complete, the town was built, and business was business as usual. In fact some believed in the 1920s that momentum seemed to cease once a formal government system and ordinances were introduced. Or people just kept moving west to see the next “new” thing. The population topped out in the 1970s at about 26,500. For whatever reason, Aberdeen has flocculated around this number for 40 years, usually below it. Finally, in the 2010 census, we had once again exceeded the 26,000 mark. In its heyday, with two major highways, an elaborate railway system, and an airport, Aberdeen manufactured and distributed candy, cigars, jewelry, radiators, baked goods, tire chains, books, lumber products, road machinery, tents and awnings, beverages, harness novelties, flour, sheet metal products, furnaces, auto tops, butter, ice cream, stock foods, heavy metal products, optical goods, ice, monuments and cement products. Items “jobbed” or warehoused and distributed through Aberdeen included groceries, fruit, drugs, hardware, tobacco, automobiles, tires, accessories, heating and plumbing fixtures, musical instruments, farm machinery, typewriters, adding machines, meat products, cut flowers, cash registers, lumber, oil, office and school supplies, gravel, leather goods, grain, glass, billiard supplies, barber supplies, seeds, flour and feed. Historically, growth occurs once transportation routes are established. But we still have all these transportation opportunities today, if not more. So where did all these industries disappear to? It seems odd that we were once the hub, or center of all this industry, yet we’ve changed dramatically. Or have we? 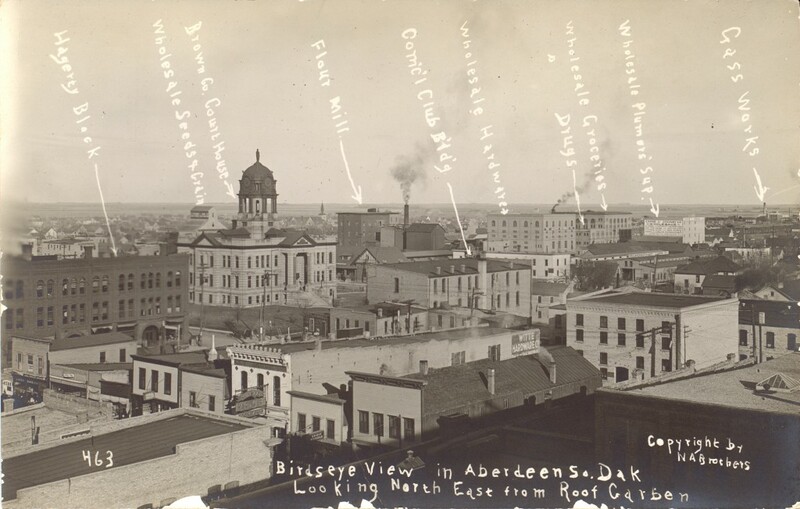 According to the late Don Artz who wrote several books about Aberdeen’s history, a man by the name of Walter Butler first drew a map of Aberdeen and labeled it as “Aberdeen, The Railway Hub of Dak.” back in 1885. The terms, Hub, Hub City were already being used in the various newspapers by citizens and writers. It seems the act of putting it down on paper as a term, and linking it to a map, inspired business leaders to capitalize on this moniker. There doesn’t appear to be an official adoption of the phrase. It just became a nickname that worked, everyone believed it, and it got attention. It appeared on everything in Aberdeen for decades. Others in the country were using it, including Boston. And, so many Easterners migrated to the Aberdeen area to establish businesses and trades. We were settled by business folk, not farming folk. In recent years, Aberdeen has conscientiously given up using the term “Hub City” in its economic development and community advertising. Previously it was splashed all over everything that left the community, including the back of the mayor’s letterhead. Aberdeen was the Hub City because of the railroad’s influence in commerce. But transportation changed, it didn’t disappear, so if the community doesn’t believe in our Hub City brand any more, the very thing that attracted others and made the town a magnet, then we won’t be the center of anything. But, today in 2015, we probably have more industry and products reaching farther around the globe than the railroad could ever provide. And that’s what we do well in Aberdeen. We make things, and why wouldn’t any business want to locate to a regional hub? When considering a move from Ohio, or Mars, wouldn’t one be attracted to the “Hub City” versus, XYZ town? We are the Hub City, as long as we say it, and believe it. Sections excerpted from Images of America: Aberdeen, by Troy McQuillen, 2012, Arcadia Publishing.